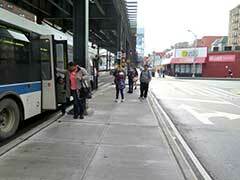 In New York City, every transit rider is also a pedestrian at some point during their journey. However, in many cases across the city, riders face significant challenges accessing transit as pedestrians. To address this problem, DOT has created the Safe Routes to Transit program. 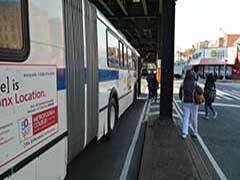 The goal of the program is to make access to transit across New York’s five boroughs safer and easier. Making targeted improvements at transit access points will benefit everyday New Yorkers and also help the City towards its Vision Zero goal of reducing serious injuries and fatalities on New York City streets. Bus Stops under the El projects improve pedestrian safety and accessibility at bus stops located underneath elevated subway structures. 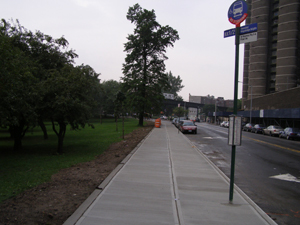 Sidewalks to Buses projects create or improve sidewalks, crosswalks and other pedestrian improvements around bus stops where walking is difficult or accessible facilities do not exist. The streets underneath elevated subway structures pose unique challenges. At most of these locations, subway columns prevent buses from accessing the curb and bus riders are forced to wait for, board, and alight the bus in the middle of the street. This leaves bus riders vulnerable to collisions with vehicles and also results in bus stops which are inaccessible for the elderly and disabled, who may require the aid of the bus ramp/lift. Through the BSUE initiative, DOT makes improvements at these locations by constructing bus boarding islands or curb extensions at existing bus stop locations under elevated trains. These improvements provide bus riders a safe space to wait for the bus and the ability to board without crossing through traffic. The improvements also enhance bus operations by increasing visibility, expediting pick up and drop off, and improving bus drivers’ ability to navigate in traffic despite the columns. 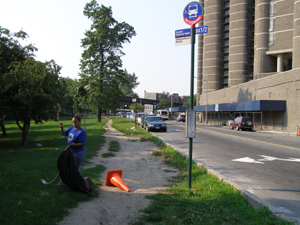 Sidewalks to Buses is an initiative that seeks to improve access to bus stops at locations where sidewalks do not currently exist or are substandard. The initiative will include installation of new sidewalks, crosswalks, and bus waiting areas to facilitate walking and transit use. Priority will be given to areas where pedestrians face high-speed or high-volume traffic on their way to and from bus stops.